As clients are increasingly becoming health conscious, interior designers can take on board some tips from health research as they are planning out a space. Jotting down some of these notes in the margins of your sketchpad can help as you are conceptualising where to put that sofa, or what colour to paint the walls. Here we look at a range of health and interior design research, and narrow down how you can use this wealth of knowledge in your daily tasks as a designer. Back in 1991, the Journal of Health Care Interior Design published an article titled 'Effects of interior design on wellness: Theory and recent scientific research'. One of the key messages in this article was that the theory of supportive design is important, because it lays out steps for improving the psychological wellbeing of people simply by the way spaces are decorated and organised. The research for this article focused on the interior design of hospital rooms, waiting areas and reception spaces to draw out the points, but that's not to say the lessons learned can't apply to the layout of a lounge or a home office. 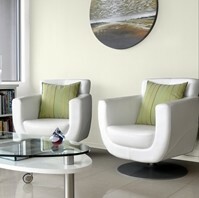 Arrange the lounge furniture so family members can make eye contact, and face each other. Such small steps that facilitate positive social interactions within the home design can help make access to social support easier. Similarly in an office, choosing round tables for meeting rooms can have a similar affect. Arrange team desks to also enable conversation and collaboration, by grouping them together in pods. Paint the walls in soothing, relaxing colours. Lighter shades are typically good for this as they reflect natural light. Resene Quarter Pearl Lusta is a good choice, because it is not only light, but it also has a warm yellow undertone to add a glow and softness to the room. Provide areas indoors or adjacent to the outdoor deck for growing a vegetable garden. This would be an ideal positive distraction, motivating your clients to live sustainable lives as well as enjoy the mental health benefits of growing greens. Dr Andrea Faber Taylor, a horticulture instructor and researcher at the Landscape and Human Health Laboratory at the University of Illinois at Urbana-Champaign, told CNN News that gardening is exceptionally useful for relieving stress. Allocate space for a small home gym or exercise area. Multiple medical studies have proven that regular exercise releases endorphins throughout the body and combats stress. By taking the time to decorate this room in a warm, welcoming atmosphere, you would be providing your clients with a positive distraction from the sedentary lifestyle of plopping down on the couch and watching TV for hours on end. "To keep the body in good health is a duty … otherwise we shall not be able to keep our mind strong and clear," said Buddha. What better message to leave this health focused article with than with the wise words of this esteemed teacher?